There are three main options of working with Coming Soon plugin by Supsystic for our customers. We have designed everything as much comfortable and understandable as possible. Coming Soon page – It is mode that your customers will see Coming Soon page with Count, Background images, Social Shares buttons, Subscribe field and you can add or delete any fields that you want. This mode helps to collect subscribers and raise interest of your customers to your future site. Here are Exclude/Show URLs feature that will be useful for you if you already have ready pages and don’t want hide them with Coming Soon mode. Actually here you can Hide/Show your Coming Soon mode only for special IPs too. 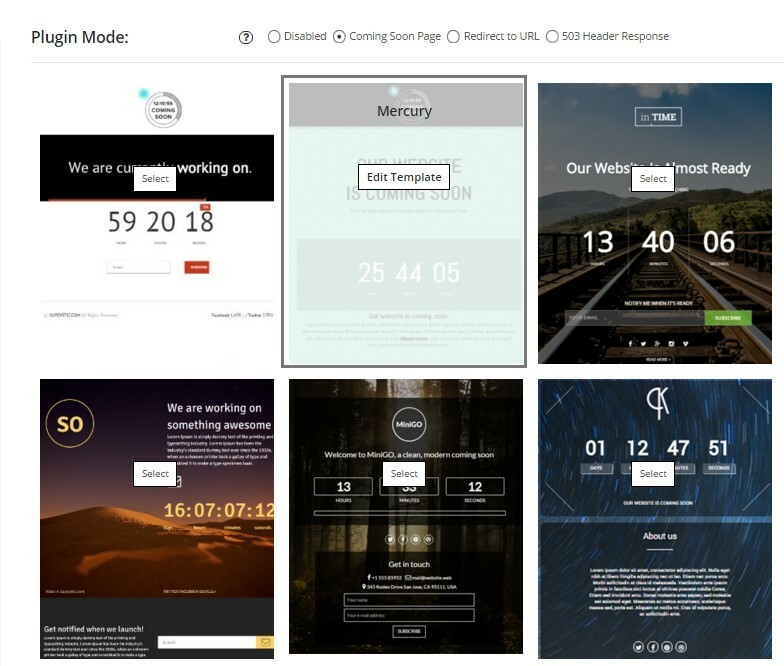 This mode allows you to change every block in the template you choose, text, pictures and images etc. Redirect to URL – It is simply and useful mode. When customers come to your page that not ready yet – they will be redirected to the page you will put in Redirect URL cell. Also in this mode you can choose Exclude/Show only on URLs and Hide/Show only for IP – pages and users for which this redirect won’t work. 503 Header Response – this mode really easy too. Just hide your pages in this mode and you users will see just error in their browser. Of course, in this mode you also can use Hide/Show only for IP and Exclude/Show URLs. NB! You can check the work of the plugin, when you enter your site as a guest, not like an admin. Just open it in another browser or in an incognito window of the current one.